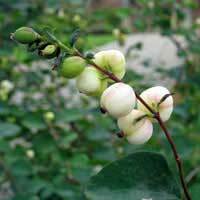 Snowberry is unlike almost any other plant in the world. Few plants have such white berries. It is a delicate looking plant with a quietly enchanting quality. The small clusters of pink flowers in the spring become the egg-white berries of late summer which last on the plant until nearly spring. In this way, they offer great fall and winter interest. The berries are rarely heavy laden, but instead seem to float lightly in the air, all about the plant. This and their small, scattered leaf pattern, give the plant a low but airy quality. They look great combined with red osier dogwood stems or floating against the dark leathery green leaves of low oregon grape. They also combine well against the grey spotted bark of red alders and amidst fields of grasses and fuschias. This is not really a stand alone plant but works better in masses or mixed with several other plants of similar height.